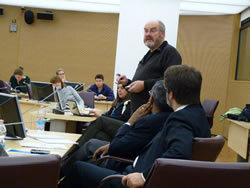 On 28 February we had the honour, privilege and pleasure of having Dave Snowden with us. Dave was in town for a Rugby match, and we decided to try our luck and ask him to visit us and give a talk on Linear versus complexity: A new thinking paradigm for the development world and his Cynefin framework. When Dave accepted to our invitation, I thought to my self, Oh My God, we'll have Dave Snowden, a leading knowledge management figure coming to IFAD. In the development world, we do not get that often someone who embodies exceptional intellectual ability, creativity and originality. In other words, we do not have geniuses visiting us that often! Dave managed to keep the audience in a complete state of awe for more than an hour and twenty minutes. 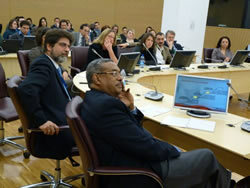 I must admit I had never seen my colleagues so focused and listening so attentively to a talk. Every single sentence Dave uttered was packed with at least five profound, new and revolutionary concepts. There was no way one could jot down all the concepts and internalize them before Dave moved on to his next sentence. Dave inspired, challenged and left us speechless. At the end of his lecture, for the rest of the day and even today are heads are still spinning. 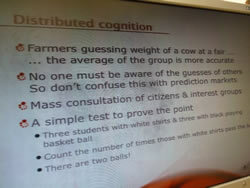 Colleagues are replaying the lecture and taking their time to internalize Dave's new thinking paradigm. Many of you in the virtual world followed us via webcast. For those who missed this unique event, Dave was kind enough to agree that we could post the recording. Make sure you watch it so that you can live our same experience. I am also including some of the tweets from the superb IFAD social reporting team and other equally reat social reporters both in and outside the room! And make sure you check out Luca Servo's blogpost: The Cynefin framework. Dear Dave, once again, thank you for making our Monday morning such a unique and rewarding experience. 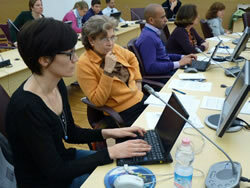 We look forward to welcoming you very soon in Rome and at IFAD! Communities of practice lost their relevance 5 years ago!